In December, we all are having a passionate love affair with sweets but come January everyone wants to join the healthy bandwagon.I decided to join a day early though ....decided to bake some healthy appetizer for the New Year Eve's party at a friend's place. It was either this or some puff pastry one , something which I wasn't feeling very inclined to do in the first place. Puff pastry might lure me at a later date but for now it was the humble but powerful spinach which beckoned me. This is where I adapted the recipe from but went for more than a couple of variations. Instead of the stuffing mix, went for the good ole croutons. Bought fresh spinach and freezed it for a couple of hours.Thought draining it would be easier but it still involved a lot of muscle power. Instead of Italian seasoning , let Sriracha sauce and garlic salt do their magic. Also, for the desi touch, added a chopped onion as well . 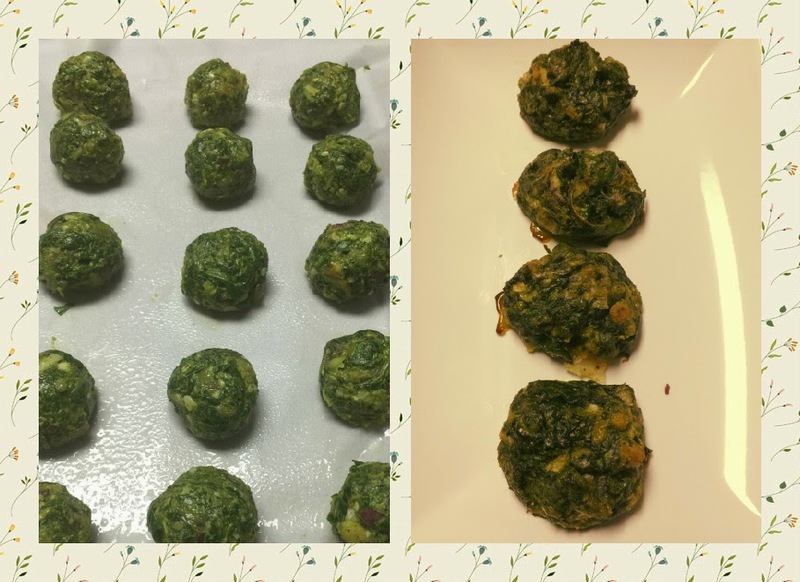 So, here is my desi spinach balls recipe. To a large bowl , just add the spinach( thawed and drained..use towel papers to drain it ) , croutons, cheese , butter, and chopped onion. Now to spice it , add the black pepper, garlic salt and our secret ingredient - Sriracha sauce. Time for the beaten eggs to be added . Mix all the ingredients well to form dough like consistency. Form into balls and line them up on a baking sheet. The recipe calls for 20 minutes but I had to bake for a good 40 minutes to ensure that they were done and cooked through.